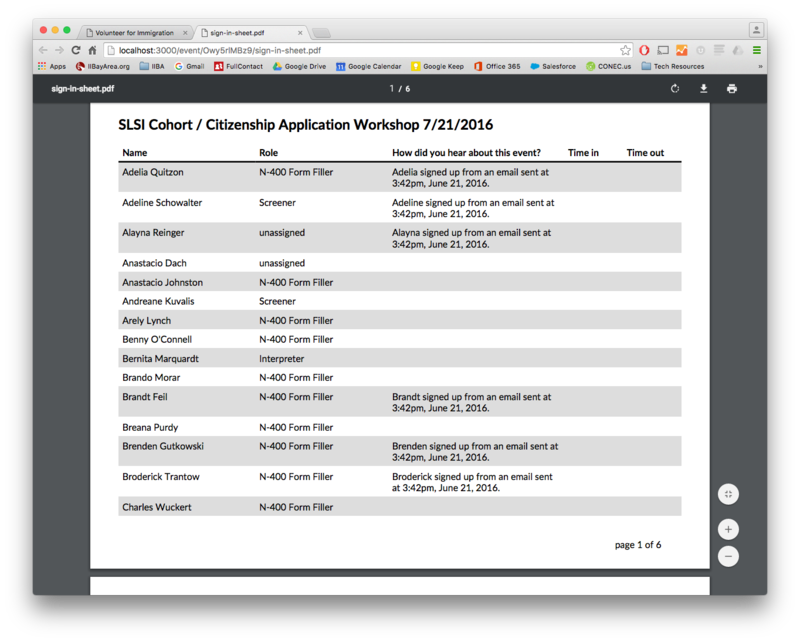 A free application for managing the volunteers of immigration workshops such as Naturalization and DACA. Give your volunteers a better sign up experience that adapts to each of them—no “log in” necessary! And if a volunteer needs to cancel, they can do so with 1-click. You’ll get a notification, and your volunteer list will be automatically updated. Want volunteers to attend in-person orientations? No problem. If a volunteer hasn’t been oriented, you can require them to register for an orientation as they sign up for an event. 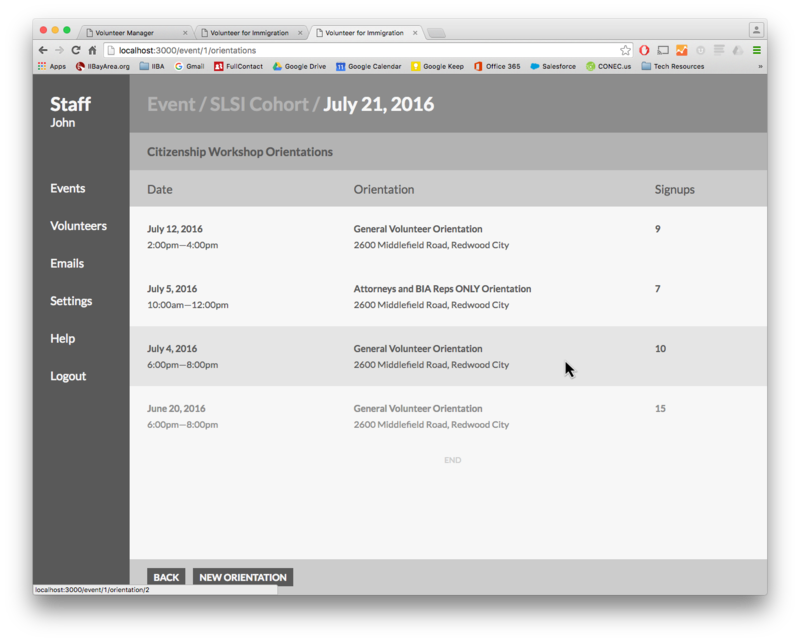 Easily view and communicate with volunteers signed up for orientations. Create volunteer roles for an event and assign volunteers to them by dragging and dropping. Easily see which volunteers are assigned to a role by clicking on it. 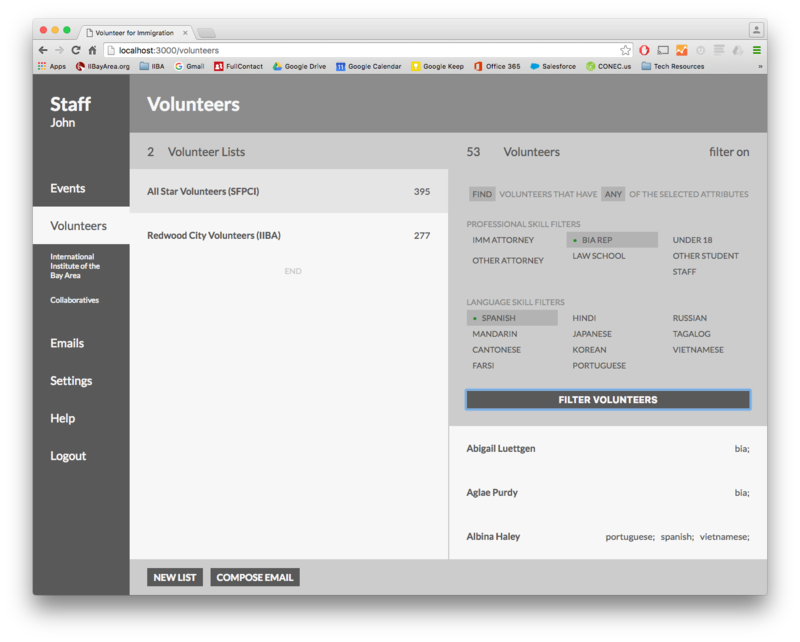 Then, if you want, 1-click creates an email for just those volunteers. See which volunteers actually showed up for an event and which didn’t. Send a thank you email only to the volunteers that attended. Easily reference what roles volunteers have had at past events when assigning them to a role at your event. Annoyed with volunteers registering after you sent out the logistics email? Update the confirmation email to include the logistics information. And the confirmation email always highlights key event information. Print out a sign in sheet or sign volunteers in on laptops. On the day of the event, easily print out a sign in sheet with 1-click. Or, go paperless and sign volunteers in using laptops--no internet connection needed! 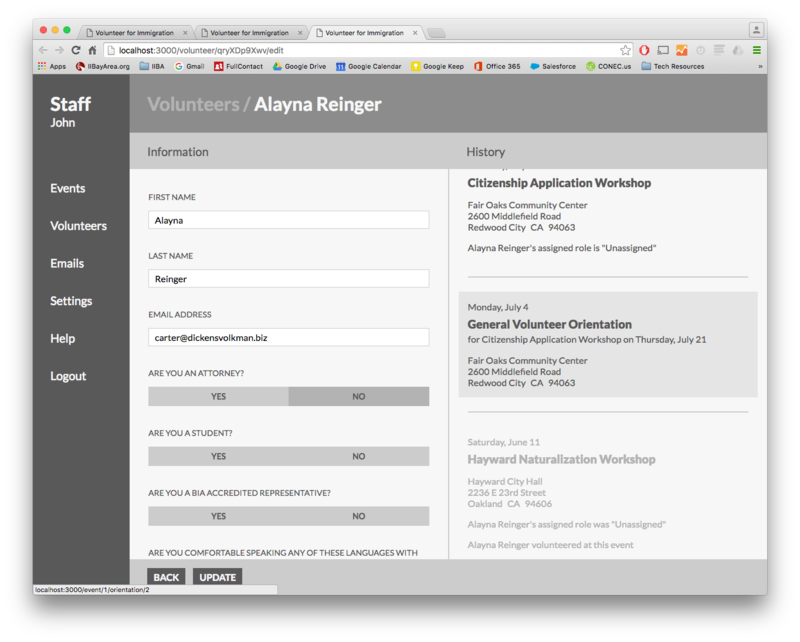 The sign in page will even tell volunteers what role they’re assigned to. Easily see which volunteers are subscribed to one or more volunteer lists, and filter those volunteers based on their attributes. 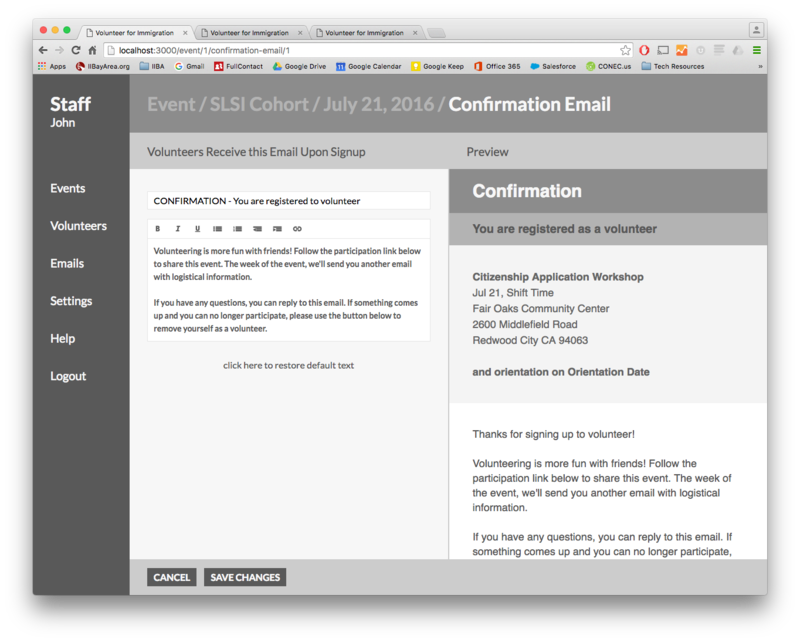 Just want to email volunteers on your “All Star” volunteer list that speak spanish and are immigration attorneys? Easy. 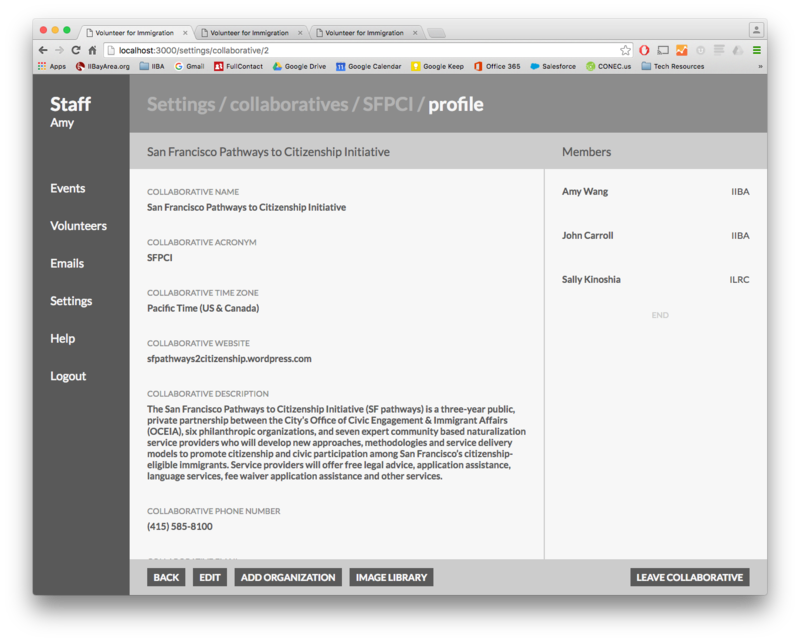 Work with collaboratives or multiple volunteer coordinators? No problem. Automatically share information with other staff members and even jointly coordinate events. The staff at other organizations will only see what's appropriate for them to see. Created with love by a volunteer. 100% free for nonprofits. Want to use volunteer.legal? It’s currently in beta. Fill out this application to get an account for your organization. If you’d like to learn more about using Volunteer.Legal to organize immigration workshops (Naturalization, DACA, etc), you can reach out to the New Americans Campaign.